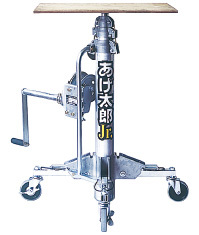 三陽機器株式会社 > SANYO KIKI CO., LTD. English page > Product guidance > Pneumatic and Wire Lifters > Agetaro Jr. 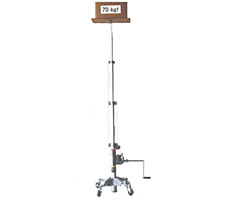 The wire lifter has a lightweight and compact body that weighs 18.6 kg (weight excluding the top plate and handle). Ease of handling in narrow places, such as the verandas of condominiums, which facilitates the efficient installation of equipment, such as air conditioners. The legs can be folded at the flip of a switch. Lightweight and compact and loaded onto vans with ease, thus ensuring ease of mobility. Lightweight and compact, yet powerful with a lifting load limit of 70 kgf (686N) and a maximum lifting height of 2,725 mm. Demonstrating power to the installation of equipment, such as air conditioners. The lifter is moved upward and downward manually with the handle. Economical with no external power required. 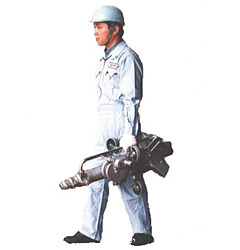 All the cylinders extends or shrinks at the same time in a wire connection method, thus ensuring the smooth operation of the handle to move the loading platform upward and downward speedily. The operation handle is provided with a brake. Therefore, the loading platform will be locked automatically when the hands are off the handle. Provided with casters, which ensures ease of movement in narrow places, such as the verandas of condominiums. Do not ride on the wire lifter. Be sure to wear a helmet and safety shoes at the time of assembling the lifter or working with lifter.